We are delighted to announce the release of our third JADE promotional video. In this episode, Crenshaw QC enlists the support of Perry to finance the cost of producing a musical that Crenshaw wrote. Watch to see the pair in a musical adaption of the infamous Governor’s pig theft case from the early days of the colony. Written & Directed by D’Arcy Foley-Dawson. Produced by Rachel Argall. Executive producers: Vivienne Rawlinson, James Mack, and Michael Green. Search bar. If you can search in Google, you already know how to search in Jade. Just start typing. We do the rest. Press enter to perform a traditional search or select a case or topic. If you want a case and know a citation, just type that. Visual Search. As part of our commitment to improving legal research, we are exploring better ways to locate materials relevant to your research. Our Professional users are able to see their searches displayed as diagrams. Seeing is believing. Citator Search. Unique to Jade, you can search the paragraph, page or section level and find references and extracts even if the full text is not yet included Jade. On the JADE youtube channel on 14 August 2013, you can enjoy our visualisations. http://www.youtube.com/watch?v=QfiypMF7dTw&HD=1 – There are two decisions of the Hight Court of Australia ( HCA 36) http://ow.ly/nUlPK and  HCA 35 http://ow.ly/nUlQg. This week many improvements were made to Jade’s Citator, which we call CaseTrace. what subsequent cases have cited the decision (this, of course, is not available in the legal headnote originally published with the case). That’s about it. At this point, the research magic stops. If the headnote or citator is electronic, you can then start clicking on links and searching within the text for relevant parts. Even in the electronic format, the legal research process is time consuming. It generates more clutter and the opportunities to make searching errors by missing important information. Because the JADE editorial team are also legally qualified, we know about legal research. We know that there is a better way. We have made JADE to solve these issues. 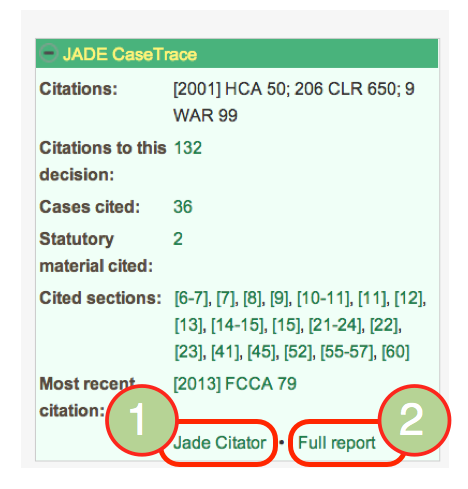 The fundamental difference with Citation Reports in Jade is that they all link to the paragraph level. The other difference is the pop-up – you can stay on the page – no more clicking and ctrl + f’ing. 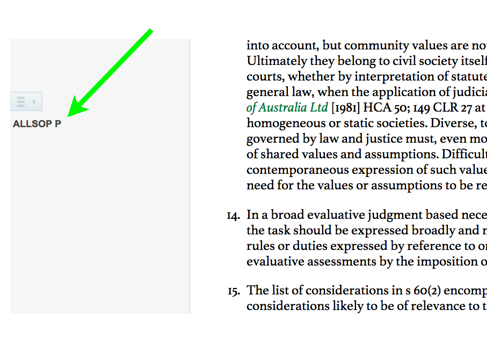 You can also see these items beside the text in a decision. Nicely popped up. The Fresher: Lets say we chose the path less travelled and clicked on JadeCitator. We would end up here. It will not look familiar – but think of it as a though you searched for Smith v R (2001) 206 CLR 650 using google. Google would be kind enough to let you know on what pages Smith v R appeared and in what context, it would also pick up that you what you mean is not only Smith v R (2001) 206 CLR 650 but also Smith v R  HCA 50. 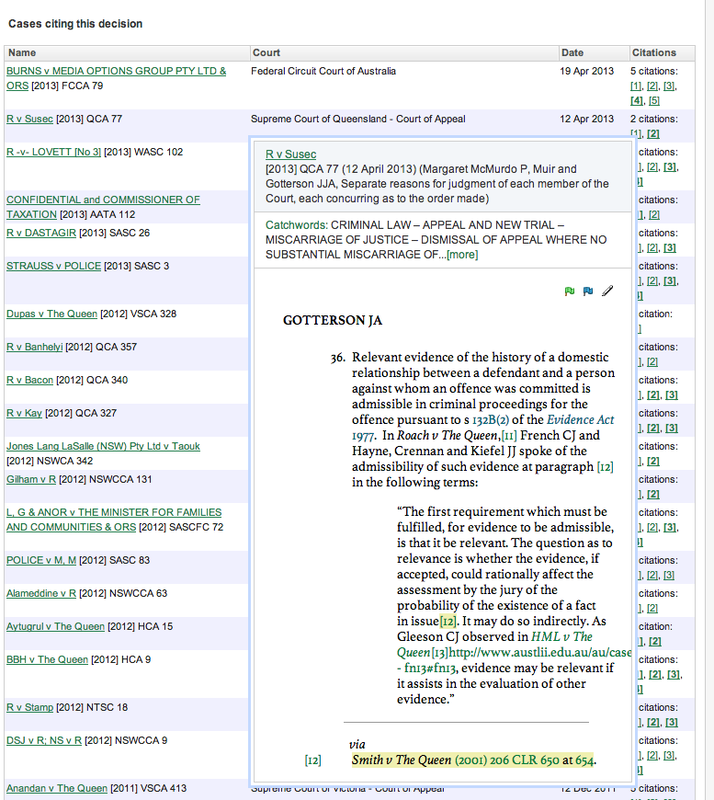 Well that is essentially what Citator does; it lets you see around the citation – lets you drill down into context. We want to make your Australian legal research as efficient as possible. 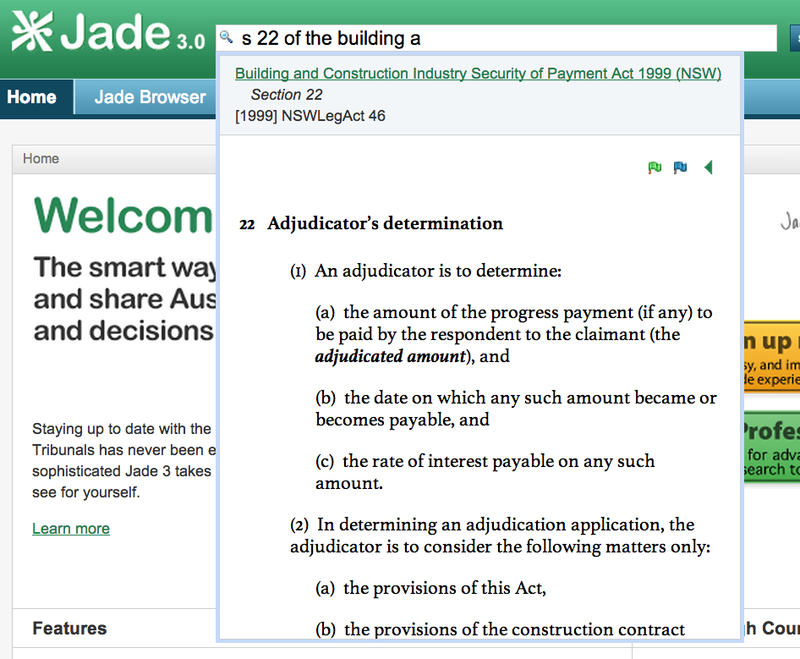 If you are a user of the JADE legal research platform, you would be well aware of the power of legal search. We also note this in our CaseTrace Service.